As a mom of four kids, with a degree in sociology and child development, Monica Tanner could easily get caught up in the hazards of technology. Her 15-year-old son is ready for a smartphone and her 12-year-old daughter can’t wait to jump on social media. But for her, she chooses to look for the good. “I acknowledge the negative, but I try to accentuate the positive and teach them to model positive technology and social media habits,” she said in our encouraging interview. Tanner is a face full of sunshine and her take on life reflects that bright view. 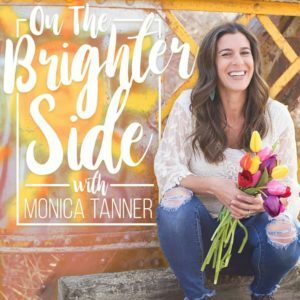 Her podcast On the Brighter Side covers life as a parent, mom and entrepreneur. She encourages individuals to chase their dreams, solve life’s tough problems and Just Do Some Good. This latest venture, a nonprofit organization completely dedicated to teaching the world how to use social media for service and kindness, is what helps drive her as a mother and role model for positive tech use in her home and community. In congruence with her tech for good attitude, Tanner acknowledges her children’s desire to have a smartphone. Currently, the family of 6 uses family flip phones for communication, when needed, but she knows they will introduce smartphones sooner than later. She strongly advocates that smartphone use should begin at home. She says watching those key indicators while your kids are under your own roof can make a big difference in how you teach them to handle tough tech situations. Along with giving them a smartphone while they are still under your protective care, she tells parents they need to have a plan in place. Just like helping a child get a learner’s permit to prepare for a driver’s license, parents should get on the smartphone, just as they would get in the car, right alongside their child. Using monitoring tools like, WebSafety, allows parents to watch their children in action and have conversations about the day to day ups and downs that they are experiencing as they navigate the online road map. There is no recipe for the perfect time to get started, Tanner admits. This is where the real parenting comes into play, when you have to understand and know your individual children’s needs and development. Tanner is referring to the constant digital notifications even adults have a difficult time navigating on their devices. 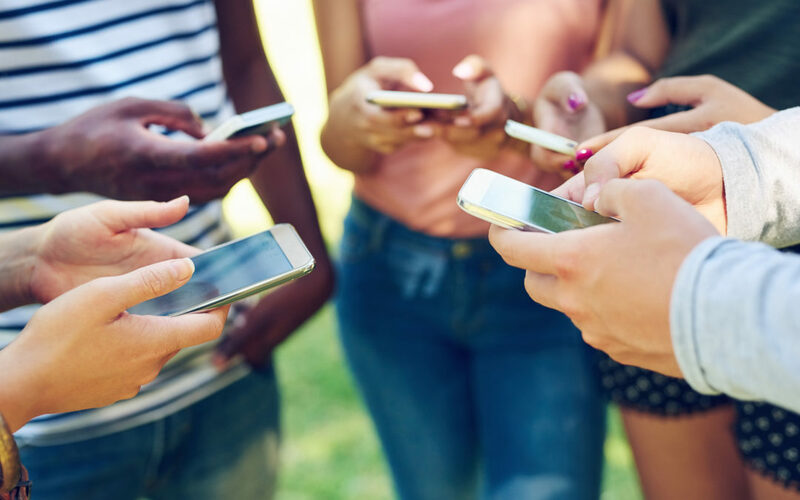 How do teens filter through the fake news, addicting online games, anxiety inducing social media posts or unfiltered graphic content without a mentor? So how does a parent know when to cross the smartphone bridge and hand over the permit? Tanner says that part is up to you. That’s why Tanner encourages parents to help their kids find their identity, sense of purpose and self confidence before entering the digital world. “I had my whole teenage years and most of my 20s to develop myself before opening myself up to all the commentaries,” says Tanner, when talking about her personal online presence. Even for her, she admits getting caught up in the numbers, likes and follows, so she knows how hard it is for those kids battling the pressure. 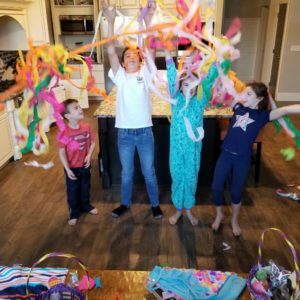 For Tanner, she helps her kids find their identity through structured and unstructured family time, exploring their hobbies and setting digital rules at home, including a screen free summer. She says that as they discover their identity, technology can become a part of it to help kids explore their purpose in life. Tanner has created her nonprofit organization Just Do Some Good, with the hopes that she can encourage social media users young and old, large followings and intimate circles, to focus on “service over selfies”. She feels her kids and every social media user deserves a world where we focus and want to emulate people who are doing good in their community. Click the following to learn more about her nonprofit or to listen to her podcast, On the Brighter Side. She has also helped coordinate a group of youth advocates, including Collin Kartchner, and tech experts, Katey McPherson, Chelsea Brown, David Gomez and Dr. Daniel Gibson, to speak in the Boise, Idaho area. 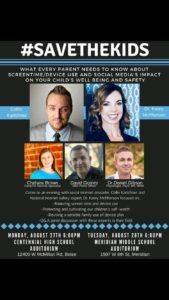 All parents are encouraged to attend this free event with questions and concerns about raising their children in a digital world. See the flier or click here for more details.